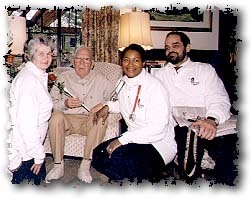 Every year on February 13 and 14 (Valentines Day) A+ Loving Care and their Strolling Violinist will visit and distribute flowers to the sick and shut in from our community (Roanoke Valley). As these dates approach please help us by identifying or calling our office with the names of individuals who are at home, in nursing homes, hospitals or assisted living facilities who would be uplifted by this joyous event. Pat Patterson lay in her bed. She didn't appear to be moving, yet surely her heart was beating and her chest rising underneath her gown. 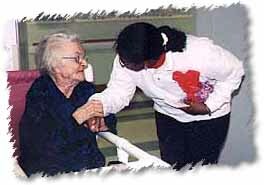 It was Valentine's Day and she was alone in her room at Richfield Retirement Community. When a man and three women entered her room, she did not acknowledge their presence. She was not being rude and they knew that. The man played her a song on his violin. 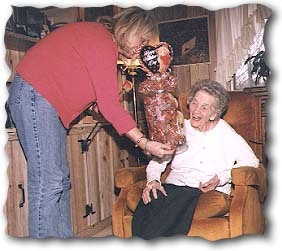 A woman tried to get her to grasp a pink rose. Still no response. Yet the group knew she could hear them and knew that she would have said thank you if her mouth would let her. Last Thursday and Friday, staff from A+ Loving Care, a local health care group that serves the elderly, traveled around to visit sick and shut-in individuals with hopes of brightening their Valentine's Day. Some gave no response like Pat, others smiled, others clapped, and still others thanked them time and time again. 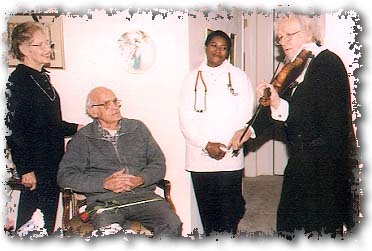 This is the third year the group has held a Valentine's Day celebration and honored the elderly by traveling throughout Salem and the Roanoke Valley with the accompaniment of strolling violinist Ake-Eric Renqvist, a Finland native. This year they even used half of February 13 to make their rounds, because one day had proved not to be enough. In Salem, the group visited Lewis-Gale Medical Center, Snyder's Nursing Hone, Richfield Retirement Community and some individual homes. Many of the elderly people visited are alone and don't have family nearby. 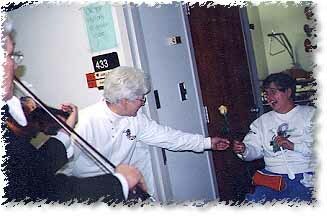 Along with the violin serenade, staff from A+ Loving Care handed out roses and back scratchers. But the music is what director Teresa Gray-Jones feels is so important. Studies have shown that the sense that remains the most acute in the elderly is hearing, she explained. "Music is so healing and therapeutic," she said, recalling an extraordinary event from a past Valentine's Day. A particular woman was said to be catatonic and hadn't changed positions for years. 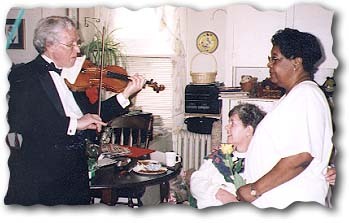 When Eric played his violin for her, Jones explained, the woman turned to watch him. After that, her nurses continue to play music in her room. Jones said she and her staff thought it was appropriate to have a Valentine's Day celebration since their logo has a heart in it. The celebration has been so successful that they plan to travel around for two full days next year. Hopefully their Finland violinist will join them as well. "The patients love Eric," Jones said. "One even asked if she could take him home."